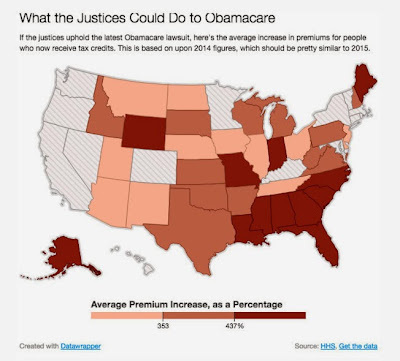 Wow, I saw this map of projected average increases in health insurance premiums if the Supreme Court eliminates ACA subsidies for people who get their insurance through the federal exchange. The darker red shaded states are places were increases will average at least 437%. That is insane, and it is concentrated mostly in the deep South, with a few other states in other regions (sorry, CaTHY).